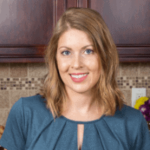 Published: Mar 1, 2016 · Modified: Apr 12, 2019 · By Jen Sobjack · This post may contain affiliate links. Follow these carefully explained instructions with photographs included for How to Make French Macarons. 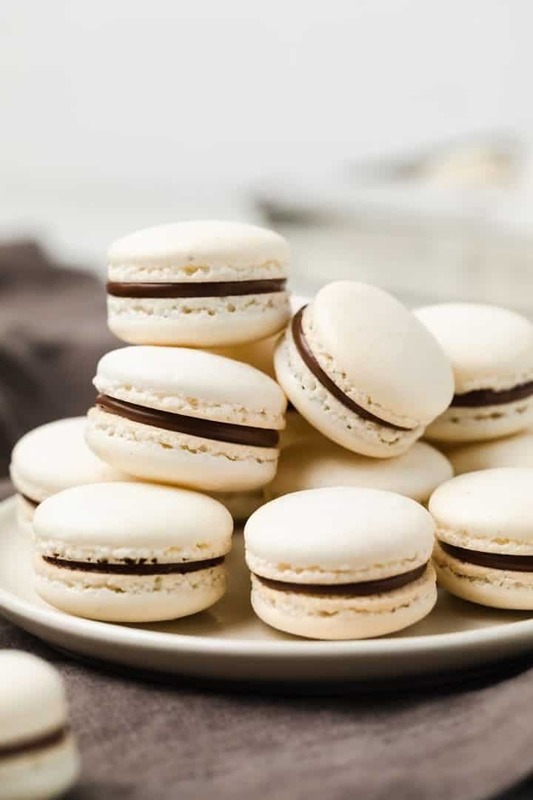 This tutorial will break down exactly what you need to do in order to achieve success each and every time you make macarons. You can have a taste of France right in your own kitchen! Macarons are finicky and require accurate measurements and a proper technique. It’s extremely important to weigh each ingredient. And it’s even more important to complete each step with the proper technique. It takes practice! I began learning how to make French Macarons over 16 weeks ago. Yes, It has taken me this long to learn the basics and perfect the technique. So don’t be discouraged if your macarons do not turn out the first time. Keep at it! Don’t attempt making macarons on a humid day!! This was my problem when I first began experimenting. It was too humid here in the summer. Winter has offered less humidity. Plus the air inside is drier due to running the heat. Now that I’ve mastered the technique I can easily whip up a batch of salted caramel ginger macarons anytime the mood strikes. If you’ve ever had a French Macaron you know all too well how incredible these delicate cookies are. They are crisp on the outside, slightly chewy on the inside, and when the shells meld with the filling, it creates a delectable texture contrast. So, so good! The shells are finicky and each step needs to be performed with accuracy. Weighing the ingredients leaves less room for error. Macarons are made with very standard ingredients. You have the dry ingredients: almond flour, powdered sugar, and salt. And you have the wet ingredients: egg whites, cream of tartar, and regular sugar. Fold the dry ingredients into the wet ingredients. Transfer the batter to a piping bag fitted with a 1/2-inch tip and pipe 1-inch circles onto a cookie sheet lined with a silicone mat. Let the piped circles sit for 45 minutes to 1 hour. The outer surface should feel completely dry before going into the oven. Have the oven preheating while the circles dry. It’s super important that they go into a hot oven. √When choosing powdered sugar for macarons, be sure cornstarch is listed on the ingredient label. √Put the dry ingredients in a food processor and let it run for a good 2 minutes. Not only will this combine the ingredients really well, but it will also grind up the almond flour. You want the dry ingredients to be as fine and grit free as possible. After blending them together, run them through a sifter or fine mesh sieve and discard any large pieces. √Pulse the regular sugar in a food processor until it turns to a fine powder. This will help it dissolve completely in the egg whites and eliminate any grit. But don’t just sub in powdered (confectioner’s) sugar. Confectioner’s sugar contains cornstarch and you shouldn’t add more since it’s in the dry ingredients. √Separate the egg whites while they are cold, place them in a glass dish, cover it with a lint-free cloth or paper towel, and let it sit on the counter overnight. This “ages” the egg whites and allows some of the moisture to evaporate. √Wash and thoroughly dry your mixing bowl and whisk attachment before whipping the egg whites. This extra step will ensure that both are clean of oils which can affect how well the egg whites whip up. √Stop whipping the egg whites as soon as they reach stiff peaks. If you overwhip and end up with dry styrofoam egg whites, you’ll have to start over. Overbeaten egg whites will cause the macarons to become hollow and crack. √Do not attempt to tint your shells until you have mastered the technique of making macarons. Adding in an extra component can throw the batter off balance and ruin the shells. Once you have made a few successful batches, you can begin experimenting with coloring the shells. You can use gel or powdered food coloring and gently fold it into the whipped egg whites. You will want to make it darker than the color you are aiming for because the color will fade slightly during baking. √It is important not to over or under mix the wet and dry ingredients. Sift the dry ingredients into the whipped egg whites in three stages. Folding only 3 to 4 times with each addition. After the last addition, fold until the batter comes together into a thick paste. It shouldn’t be too loose or runny. Transferring it to a piping bag and working the batter as you pipe will loosen it, so a thicker batter going in is a good thing. Also, let the batter rest for about 20 minutes in the mixing bowl before you add it to your piping bag. Also, let the batter rest for about 20 minutes in the mixing bowl before you add it to your piping bag. √Remove the air bubbles. Air bubbles can cause the shells to crack. After piping the batter into mounds, rap the baking sheet firmly but gently onto the countertop. This will force the air bubbles to the surface. Use a wooden toothpick to pop the bubbles. √Bake the shells for 15 to 18 minutes at a low heat. They will develop their signature “feet” and brown slightly all over. If the bottoms of the shells start becoming too brown before they are done, add a second cookie sheet underneath the one the shells are on. √Let the shells cool completely before trying to remove them from the pan. If you try to remove them while they are warm, the feet will stick and possibly tear off. √Once the shells have cooled completely, fill them with frosting, curd, caramel, or ganache and let them sit overnight. The filling will meld with the shells, creating a soft and chewy texture. It’s worth the wait! You now have all the essentials for making french macarons! Follow these carefully explained instructions with photographs included for French Macarons. 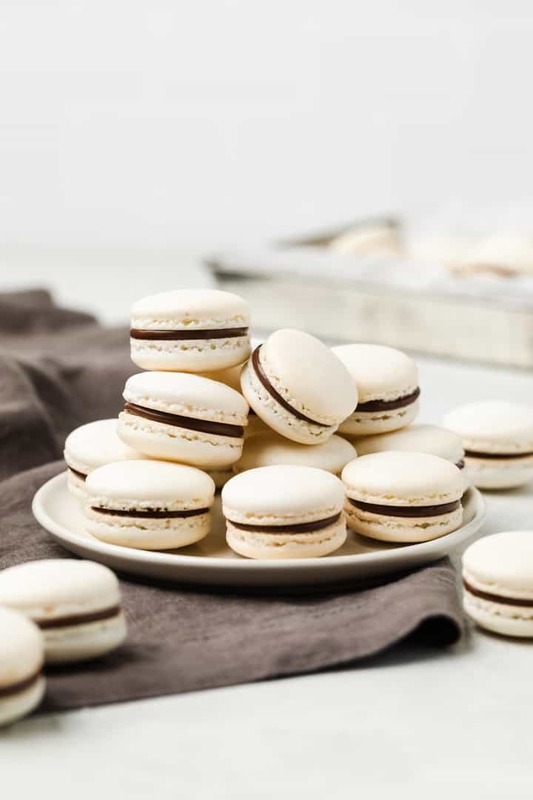 This tutorial will break down exactly what you need to do in order to achieve success each and every time you make macarons. You can have a taste of France right in your own kitchen! Pace the powdered sugar, almond flour, and salt in a food processor and process for 2 minutes, until finely ground and well blended. Sift the mixture to remove any larger bits. In the bowl of a stand mixer fitted with the whisk attachment, whip the egg whites and cream of tartar on medium speed until frothy. Gradually add the granulated sugar. Turn the speed up to medium-high and whip just until stiff peaks form. Take extra care not to over whip. Sift the almond flour mixture into the whipped egg whites in three separate additions, folding only 3 to 4 times after each addition. After the final addition, fold until batter becomes thick and smooth. When folding, cut through the meringue and then fold up and over. Scrape the sides and turn the bowl as you go. Let the batter sit for 20 minutes. Meanwhile, adjust the oven rack to the center of the oven and preheat the to 300ºF. Bake one sheet of cookies at a time for about 15 to 18 minutes, rotating halfway through.The macarons are done when you can just barely separate the shells from the silicone mat. The cookies will brown slightly. If the bottoms begin to get too brown place a second cookie sheet underneath. Cool the shells completely on the baking sheet set on a wire rack. Do not attempt to remove the shells from the silicone mat until they are completely cooled or they may stick and break off. Sandwich two cookies together with your favorite filling. 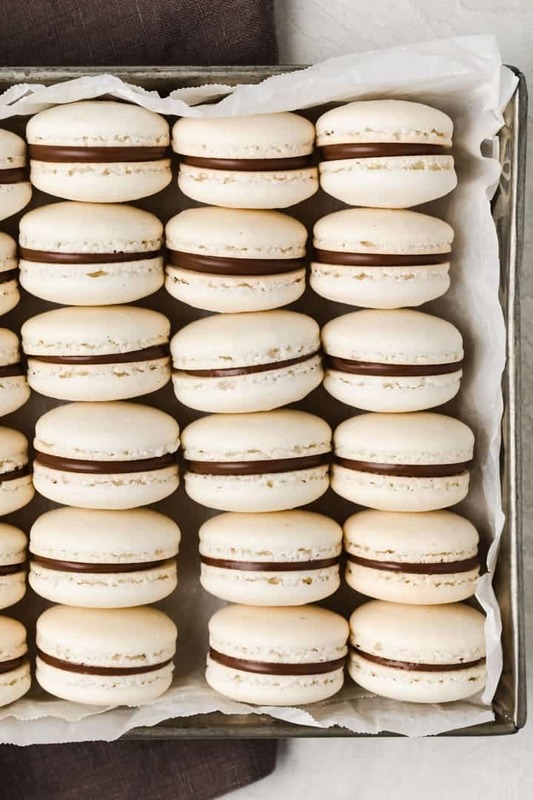 Store the macarons in the refrigerator for at least one day and bring them to room temperature just before serving. They taste the best this way. Because macarons are so finicky, the ingredients are listed in metric. Measuring by weight will ensure you are using the exact amount necessary for the macarons to turn out properly. Adapted from Joy of Baking, Baking a Moment, and Sally’s Baking Addiction. The Recipe says to bake for 15-18 minutes but on the tips is says to cook 10-12 minutes. Can you clarify? I can make pitchacho favor ? You can try using finely ground pistachios in place of some or all of the ground almonds. Or use pistachio extract in your filling. Hi, can I bake 2 Or 3 trays at the same time? I suggest just baking one tray at a time so they bake evenly. It’s always best to weigh the ingredients for macarons since they can be so finicky. I don’t over whip the egg whites, I fold the dry ingredients in gently, I remove the air bubbles, and let them dry for a good hour. I monitor the temp in the oven, too. But, my macarons are hollow and stick to the silpat. Any troubleshooting help? There are a number of things that could be going wrong. Did you age your egg whites? Did you let it rest for about 20 minutes before adding it to the piping bag? Does your powdered sugar contain cornstarch? Did you stop whipping as soon as the egg whites reached stiff peaks? Did you let the piped macarons rest until they were firm to the touch? This may take longer than 1 hour. You also may need to double stack the baking sheets. Once the macarons have baked and are completely cool, use an offset spatula to scrape them off the silpat. This will keep the bottoms intact. One more thing, Jen. 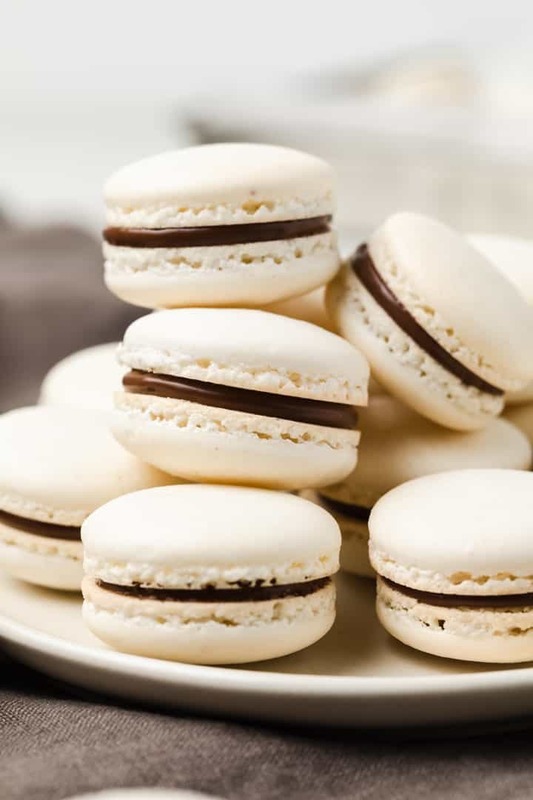 Do you have a chocolate macaron recipe. I could add some cocoa but I am afraid I will change the consistency. If this is the case, how much cocoa do you add? Thanks again, Jen. You are great! I don’t have a chocolate macaron recipe yet. But you can remove 2-3 tablespoons of the powdered sugar and add in an equal amount of unsweetened cocoa powder. You are amazing! I have struggled with these for so long, you come along and I followed your instructions to s T and before I knew it, beautiful macaroons with beautiful feet. Thank you so much, you have no idea what this means to me. No other article has even come close to producing these beauties. I’m so happy to hear you had success with the recipe! It took me a really long time to master the technique and it’s so rewarding to be able to teach others what I learned. please, can you tell what eggs means 100 grams aged room temperature egg whites? It’s hard to say if you need 3 or 4 egg whites, that all depends on how big the eggs are. You really need to use a scale and weigh out 100 grams. Macarons are finicky and need accurate measurements. Age your egg whites by separating them while they are cold, place them in a glass container, cover the container with a lint free cloth, and leave it on the counter top overnight. Also if you do not have cream of tartar, simply leave it out. Do not substitute lemon juice in it’s place. Macaroons are so intimidating! Give me the courage Jen and I will try. By the way, the pictures are amazing, nice job! You can do it!! I have faith in you! 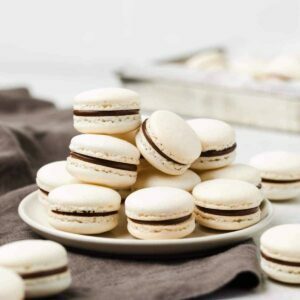 I JUST got my hands on some bob’s red mill almond flour too, and I’ve been wanting to try out some macarons, so I’m pinning these tips to save for later! Hopefully not too much later, these look scrumptious! Thanks, Aimee! I hope you try making them soon! Wow Jen. . .such a great tutorial. I fell in love with macaroons in Switzerland but have yet to build up the courage to make my own. Yours look like perfection. And with this detailed tutorial, I think I just might be ready to take the leap. Of course it helps that the Mr. will be taking many trips to Shanghai while he waits for his work permit. . .so I will have some extra time in between mandarin lessons. I have always wanted to learn how to make these but everytime I fail! Now I am so happy that you have given a super detailed tutorial!! Love this Jen! French macarons are always a special treat! I don’t make them nearly as much as I should because they are a little daunting, especially in the Florida heat. Great tips, I love the little mickey ear silpat! These are definitely Paris pastry shop worthy! So perfect and petite. I love the dedication you gave to this one recipe. Really beautiful, my friend! Oh my gosh, Jen!! Are you sure these didn’t come from a fancy French bakery?? Because these seriously look THAT gorgeous! I am so impressed by these! Also, I think you just convinced me to put on my big girl pants and finally try homemade macarons! You have to! It’s so rewarding once you master the technique. These macarons look gorgeous! Love them! Thanks for all the tips, now I can try making macarons again! Pinned! There were times when I was ready to throw failed macarons across the room. I had to walk away and revisit them after some time had passed. Yay for mastering macarons! They look amazing, Jen! Love all your tips and your baking mat is so adorable! These look amazing! Macarons are one of my baking fears haha 🙂 You’re making me want to try them out! Thank you so much Medha! Jen, I’ve made macarons before but yours look perfect and amazing and wow! like from a french bakery!!! love love love! did you fill yours with ganache? Thanks, Alice! I just slapped some Nutella in these for the photos. But I do have another post coming this week with fun cheesecake flavors for Easter! yay for perfect macarons! They look absolutely lovely Jen and you already know much I adore macarons! Wish I could grab some right now! These are absolutely gorgeous, Jen! Definitely the perfect macarons. I wish I could reach right through my screen and grab a few. I’ve never attempted to make these before because I’ve been too afraid to, but I definitely need to after your helpful tips. Your journey to finally perfecting these paid off…love it!